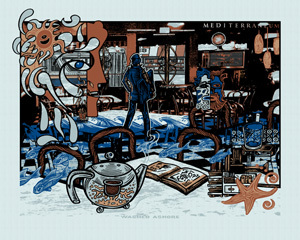 This print is a personal take on the history of Caffe Mediterraneum on Telegraph Ave. in Berkeley. In addition to being the oldest coffeehouse in the East Bay and the birthplace of the Latte, The Med has a history of being a mecca for burgeoning Beatnicks, Hippies, Punks, Artists, Writers, Political Radicals.. a myriad of people who 'dropped out' of their set life path to become something more interesting. This piece is for these people who Washed Ashore in Berkeley over the last five decades. I see the faces of the mural inside The Med as a set of gritty 'regulars' frozen in time. I imgine them witnessing Allen Ginsberg writing Howl in the summer of 1955. Later they watched as Lino Meiorin first refused, then capitulated and allowed Mike Nichols to bring his film crew in to film Dustin Hoffman for a scene of The Graduate in 1967. This piece has the stark light of late afternoon, as these regulars are sitting, sipping and reading. The central figure is based on a woodcut by Lynd Ward from his graphic novel about a young artist called 'God's Man', which inspired Ginsberg in writing Howl. In the background to the left you can see a vintage AC Transit going by as a reference to the scene of the Graduate that was shot there. And the fishes below speak to the personal evolutions that began on these shores.